LynchyRightNow.Com is proud to present to you, Keep It Real Fridays. This week's edition will be the inaugural edition and released every Friday, barring tornadoes, hurricanes, incarceration, or anything else that might prevent me from doing so. First off I would like to tell you where I got the idea from, it's actually a good story. Last week, while listening to Patrick Crayton, wide receiver of the Dallas Cowboys, on an ESPN radio show, he revealed that each THURSDAY (we changed the day due to complications) the Cowboys lock themselves away and give all the players, coaches, and ex-wives (just kidding) time to KEEP IT REAL. Basically, they just sit in a room and let out all their frustrations with the team or anything else that is bothering them. I would like to mention that I'D LOVE TO BE IN THIS ROOM ANYDAY, ANYTIME. Romo talking about Jessica Simpson, T.O. (nuff said) and the rest of America's team airing it out for the whole team to KEEP IT REAL, that's priceless. Anyway, it got me to thinking, my life might be a whole lot calmer if I let everyone know, how to KEEP IT REAL! Josh Hamilton's story of non-performance enhancing drugs, alcoholism, and baseball isn't nearly the story of one Jon Lester. I don't want to beat a dead horse but come on, ask yourself who you'd want your kids to look up to? Example A: Hamilton, used every drug known to mankind, ran himself out of pro baseball, hurt his fans, teammates, family, and more importantly, himself. He found Jesus, began to play baseball again and play well, elected to the all-star team, and let the world know that recovery is always a possibility. Example B: Bright-eyed kid makes it to the majors, pitches in front of the greatest fan base in the world, watches his boyhood dreams come true. Shortly after that, he discovers discomfort in his back which turns out to be cancer. His dreams are ripped away from him and he is now just a kid looking at an unpreventable disease. Lester defeats cancer, pitches in the World Series, and then follows that up with his first career no-hitter, something some Hall of Famers never do. Time to KEEP IT REAL folks, Hamilton has defeated personal demons that he chose and my hat goes off to that, some people never can. He's an inspiration to addicts and families of addicts everywhere; But Jon Lester defeated a disease in which 1 out of every 2 males can develop throughout their lives, yet he didn't choose that life, it chose him. 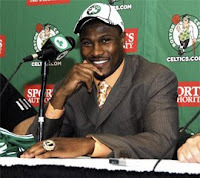 In Danny I trust, the 2008 NBA Champs lost out on the Corey Maggette sweepstakes, someone I would have loved to see in a C's jersey. Followed up by that was the prompt signing of James Posey by the Nawlins' Hornets. I'm upset that Posey didn't get a deal done with the Celtics, but coming off of a championship I've decided to KEEP IT REAL, and give Ainge a pass. I wish him all the luck in Hornetville, it's a great fit for him. Playing with Chris Paul, Tyson Chandler, and David West easily gives the Hornets a chance to at least duplicate their 2007-2008 success. Like with Theo Epstein and Jerry Jones, until their wrong and banners aren't being raised, Danny gets a pass, I KEEP IT REAL. FAVREgate has become an ESPN daily topic, it's the middle of the summer and too early to start talking Fall Classic. Forget about all the Ted Thompson v. Brett Favre talk, I'm taking this in a different direction, right toward the comments of Arizona Cardinals quarterback, Matt Leinart. Leinart on FAVREgate: I'm paraphrasing " . . Just let Brett play somewhere, he is a legend, maybe the best (what?!?!?!) and if it's in Green Bay, Aaron's just got to know that and Brett should play"
"I'm going to KEEP IT REAL, NO COMMENT!" I'm not sure why Matt Leinart, who is completely removed from the situation, couldn't have responded like Aaron Rodgers, whose livelihood depends on the outcome. Rodgers respectfully gave props to Favre and then said, what happens next doesn't concern me entirely. Leinart, you have your own worries in AZ. "I want to thank Tiger, for not being here . . "
Hey, at least the guy is honest. The winner of the 2008 British Open will be able to slide a feather in his cap for winning a major, but will he be happier about his play or happy that he didn't have to take on the greatest golfer of all time? When Tiger Woods isn't involved on Sundays the television ratings are down, the Sports Illustrated cover will go to a non-golfer, and you won't remember who won. That's the reality of the "Tiger Years" in professional golf. Maybe not an asterisk, but maybe a special Sergio-like shout out at the end is appropriate. Keep it REAL! I wanted to rip Alex Rodriguez this week, I really did, but it feels like were piling on. After the controversial superstar exited Tuesday nights marathon Mid-Summer classic a few innings early, the A-Rod hawks were out in full force. I've got to tell you the truth, I'm not surprised. New York Yankee Alex isn't the same Alex that moved to 3rd base and let Cal play short in his very last All-Star game in 2001. He just isn't the same guy, but do we really know what being Alex Rodriguez is like? None of us will make the type of income that Alex Rodriguez makes, we won't even sniff that kind of green. The loads of pressure it takes to play in New York City alone could crush a man. Listen, Alex didn't have the benefit of playing alongside Yankees like Paul O'Neil and Scott Brosius, he didn't have the benefit of capturing titles in his fist few major league seasons like Jeter did, he's a hired gun and he'll never be that true Yankee that people expect him to be. You know what's real? Alex Rodriguez not standing on the dug out steps at 1:40 AM waiting to see who wins the All-Star game he participated in hours earlier. Kevin Youkilis and Derek Jeter are players who do that, that just isn't Alex. He's become something none of us will ever be able to, or maybe even want to. Sure I'll eat my words at some point, but for right now, I'm KEEPING IT REAL!